When the American lotto game, Powerball rose to $403 million, Charles Maas, said that if he won the jackpot, that he would do the “fancy dance.” He might not have own the top tiered jackpot prize, but he did in fact win a lot more than he ever did in Saturday’s draw – a cool $50,000. After double checking the winning Powerball numbers in Sunday’s paper, Charles was a little unsure whether or not he had won anything. After rechecking he realised that he had in fact matched 4 of the 5 main numbers to win $50,000.00. Charles had purchased his winning Powerball ticket as quickpick usa lotto ticket at Buehler’s IGA, 12500 N. Highway 41 North in Evansville. He knew he had to drive through to Indianapolis to claim his lotto win, but having a enough fuel could quite have easily been an issue, and he had to first double check that too. “(I knew) it would be enough to cover the gas to drive up to Indianapolis," Charles said. While driving to Indianapolis, Charles still wondered whether he had really won the lottery money, or whether it would end up being one huge mistake. Still unconvinced he plodded on to the lottery offices. “I’ll believe it when I see it,” he joked of his prize money before his claim was processed. Here at PlayUSALotteries.com, online usa lotto players can rest assured that pay-out is guaranteed! As one of the world’s biggest and most trusted lottery ticket buying concierge company we have a vested interest in paying our members. Our company is built on repeat business without which we would not succeed. Since inception in 1998, we have maintained a 100% pay-out record to our winners. Charles is a regular Powerball player and even though he too had reservations whether he would actually be paid out, he has thankfully learned that anyone can win the lottery and more importantly, you will get your money. With his $50,000.00 safely in his bank account, Charles plans to put his prize toward college funds for his grandchildren. Lois Olson, 80, grew up during a time where indoor plumbing, electricity and a telephone were definitely luxuries. It was only when Lois moved into a brand new house in a small farming village in Alberta, Canada, that she thought she had won the lottery due to the fact that the house had indoor plumbing and even a telephone. “I thought I was in heaven, I had running water and I had a telephone,” she recalled. So it’s no wonder that when Lois found out that she had won $50 million on the lottery, that she had difficulty imaging what she could do with her amazing lottery win. Lois realised that she had won the lottery while out grocery shopping. While at the supermarket she decided to check her lottery ticket at the self-checking machines. Reminds us of Charles who also just couldn’t believe the fact that it was his time to shine and start living the lotto life. Naturally the news that there was a huge lotto win from the central Alberta village of Irma, travelled at lightning speed amongst the 450 community. Lois told lottery officials that she saw the media arrive in her village, but avoided them. “I dodged the media once there,” said Lois, laughing. The locals were being interviewed about the big lottery winner. 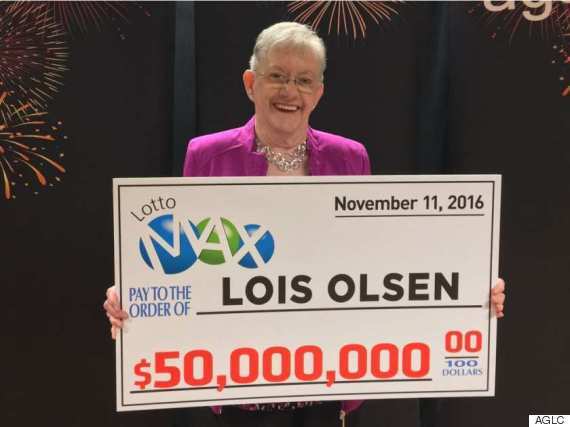 After living in the small farming village in Alberta for 50 years, Lois said that it’s a real pity that she never won the $50,000.00, thirty years ago. Lois said that she will buy a new car with money and help her family. With three children, nine grandchildren and eight great-grandchildren it’s a good thing that Lois has won $50,000.00 as there is more than enough for her to now help them, but we have to agree, the lotto jackpot of this magnitude would have definitely been fabulous back when Lois was in the prime of her life. But such is life, and everything is meant to be. This article just proves,that anyone can be a jackpot winner.Keep playing,but play responsibly and never give up. i played GERMAN LOTTO & OZ POWER BALL LOTTO , i want to win 1 m $ & 0.2 m $, my photo will be post with my winning CHEQUE, GOD , pl, bless me. Play play play till luck hits you in the eye. my photo will be published through internet WORLD WIDE, after winning JACKPOT of GERMAN LOTTO, which i purchased on 10/12/2016, waiting for the result.